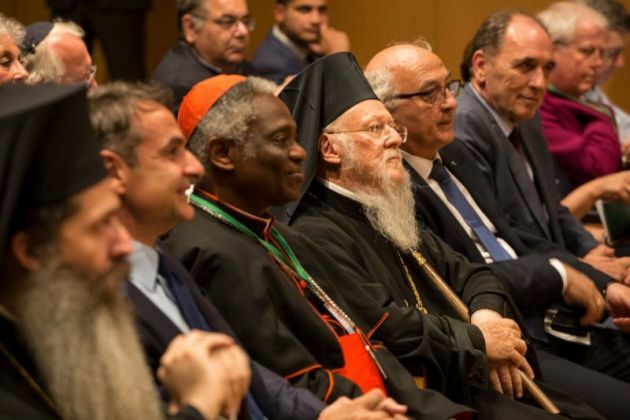 Ecumenical Patriarch Bartholomew has officially opened the international ecological symposium "Toward a Greener Attica: Preserving the Planet and Protecting its People" at the Acropolis Museum in Athens. The symposium includes 200 theologians and scientists, political and business leaders, professors and students, as well as activists from Asia, America, Africa, Europe, and Greece. In his keynote address, Bartholomew, known as "the Green Patriarch," observed how "the ecological crisis has revealed that our world constitutes a seamless whole, that our problems are universally shared." Organizers said, "Participants will explore the pressing environmental problems of the region and its islands, examining the connections between ecology and economy, particularly in the context of pressing social and environmental challenges of our time." Attica is the peninsula that encompasses the city of Athens, the capital of Greece. Bartholomew highlighted the ecological problems of the surrounding region of Attica and Greece. "Much remains to be done in order to reduce the unacceptable trash in the surrounding mountainside of Attica with its deplorable landfills and to resolve the unjustifiable plastic on the floor of the surrounding sea that threatens marine life,"
The symposium will travel to the islands of Spetses and Hydra, concluding with a session on board a ship on June 8. The Ecumenical Patriarchate says Bartholomew is spiritual leader to 300 million Orthodox Christians worldwide. He was born in Imvros (Gokçeada), Turkey in 1940 and he is 270th Archbishop of the 2000-year-old Church founded by St. Andrew, serving as Archbishop of Constantinople-New Rome, and Ecumenical Patriarch since 1991. He has been a trailblazer on the issues related to the protection of the natural environment, organizing numerous symposia, summits and seminars on the ecological crisis. He was named one of Time Magazine's 100 Most Influential People in the World in 2013 for "defining environmentalism as a spiritual responsibility," while The Guardian newspaper in London recognized him as one of the world's leaders in raising environmental awareness. One of his favorite catchphrases is: "War in the name of religion, is war against religion." For these achievements, in 1997, he was awarded the Gold Medal of the United States Congress.